Happy September, everybody! I am happy to finally get a chance to write this post which is long overdue. I spent the last three-ish months with very limited Internet, so having the luxury of wifi back is more than a treat. For the last two summers, I was away working and living in Alberta. The first time I went, I brought my running shoes and had a calendar full of goals to accomplish while I was there. I was looking forward to new terrain, a less humid climate and new scenery to accompany my weekly jogs. Turns out, I worked around the clock, ate way too much (even though the food was not too tasty) and didn’t go for a jog once. Not once. How on earth could I let this happen? I was so consumed by the crazy, fun, challenging work I was doing and every spec of time that I had for leisure transformed into drinks with friends or naps or a bite to eat in town. When I came home at the end of the summer I was exhausted, but also plagued with guilt because I had completely failed all my expectations over the summer for running. After all, that was right around when I started this blog and I wanted to start strong, not rolly polly and out of shape. Flash forward to this past summer. I did the same job and knew what I was in for. This summer I did not even bring my good running shoes (I did bring runners though.) I knew my running regime wasn’t going to happen. I wound up going for a really cool hike near the mountains, did morning yoga regularly (if even for only fifteen minutes) and did ALOT of walking. I’m happily back in Winnipeg now and back to my running regime. The moral of my story is there’s no reason to ever feel failure if you can learn to set reasonable expectations for yourself. Feeling satisfaction in your fitness regime should never require comparing yourself to the person on the treadmill beside you, the jogger passing you on the trails, or the Tweeter who shares every time they go for a long run. Do what works for you, and set goals that are reasonable for you. If you can’t measure up to the goals you set, SET NEW ONES. There’s nothing worse than giving up on yourself entirely because your goals were too out of reach. My message is one you’ve probably heard before. But one of the reasons I’m saying it anyway is because this is an absolutely beautiful time of year to start new goals! Fall is my absolute favourite time of the year to jog. The air smells so fresh and crisp, and the temperature is near perfect for pushing yourself and wearing normal workout gear. No snow pants and facial Vaseline, no overly revealing and unfortunate jogging shorts. Just autumn breeze and a light jacket. Don’t wait for New Year’s resolution time to challenge yourself, get out there and accomplish something new! Just keep your motivation high and your expectations reasonable. A study by the National Institutes of Health says that the average person gains less than one pound during the holiday season. That doesn’t mean starting now, does it? No matter how hard some of us try, it’s hard to avoid the candy and chocolate associated with Halloween. I’ve never been against indulging in a treat once in a while, but I am also very cautious not to give into the slippery “oh well, I’m on holidays” mentality. Not for two whole months anyway. People with self control avoid these treats and carry on with their lives. As for the rest of us, we find ways to justify a little indulging. Before you talk yourself into your next chocolate bar coma, consider which snacks might actually be healthy for you. True, Halloween candy is going to be processed, but making smart choices can make the difference between afternoon energy and an afternoon crash. Not to mention the sluggish post-candy workouts you can easily avoid. Peanut M&Ms – In my research, Peanut M&Ms are one of the highest recommended choices for a nutritious snack. It helps that you only get maybe 8 candies in a pack. However, this treat is also low on the glycemic index, which means they release their sugar slowly and will keep you satisfied for a long time. A good rule of thumb is to choose any treat with nuts because you know you are at least getting protein and energy. Kit Kat – Because this candy bar is filled with a wafer rather than caramel or nougat, it is a better choice over many others because it saves you some calories and saturated fat. An even healthier option is an Obel Double Dark Chocolate Wafer Bar covered in 70% dark chocolate. If you purchase Halloween candy solely for your personal consumption, give this bar a try for sure. York Peppermint Pattie – This Halloween treat is a good choice because it works on a psychological level. Mint is a flavor that people associate with finishing their palate, so when you enjoy a peppermint treat, you are less likely to continue snacking. Plus, if you just eat one, you are only setting yourself back about 50 calories. Candy apple – No longer a trick-or-treater staple, the candy apple is still a decent Halloween treat if you find yourself in front of a Halloween spread at a party or event. Beneath that not-so-healthy coating is a good ol’ apple full of fibre and vitamins. Beware of caramel apples, they have way more sugar and fat in the coating. 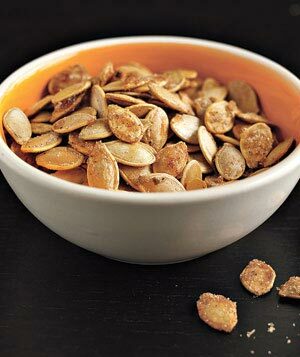 Pumpkin seeds – Not exactly candy, but they are high in zinc to boost immune function, antioxidants, and of course protein. Liven up this classic with a dusting of cinnamon, nutmeg, salt, and sugar before toasting.